Easter is one of my favorite holidays, because of its rich Ukrainian traditions. One of these traditions is the blessing of a Basket of Special Foods, each having a symbolic meaning (please click on the balded link for more information). This blessed food, including meats, is served for brunch on Easter Sunday, after a three hour Special Easter Sunday Liturgy, and the singing of the Easter Hymn “Khrystos Voskres” (Christ Is Risen). The Easter Sunday Brunch is the first meat meal, after a strict fast on Good Friday, Saturday and Easter Sunday morning. 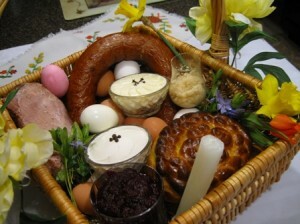 One of the special foods in that basket is a round shaped Easter Bread, called Paska in Ukrainian, or Babka in Polish. The top of this bread is elaborately decorated with fancy dough ornaments, having a cross as the central motif. Here is my favorite Paska recipe, inspired by a recipe from Traditional Ukrainian Cookery, by Savella Stechishin. This recipe yields two large loaves, or few small round ones. Dissolve the sugar in the lukewarm water and sprinkle the yeast over it. Let it stand for 10 minutes in a warm place, until bubbly. Combine the softened yeast with the lukewarm milk and 5 cups of flour. Cover and let the batter rise in a warm place until light and bubbly (I like to keep it in a warm oven. I preheat the oven to 150 degrees F, turn it off, the place the batter there to rise). Once the batter is ready, add the beaten eggs, sugar, melted butter, salt, orange and lemon zest. 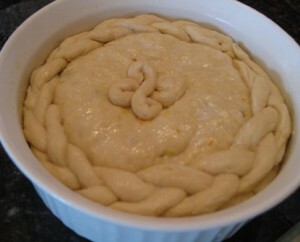 Gradually keep on adding the remaining flour, and mixing,until the dough is neither too soft, nor too stiff. Sometimes I use only 5 cups of flour, but other times all 6 cups are used, depending on the humidity in the house and the flour. If using raisins, add them in now. Knead until the dough no longer sticks to the hand (at least 30 minutes by hand, or 20 minutes in a mixer). Cover the bowl of dough with a tea towel, place it in a warm place, free of draft (I use the warm oven again), and let it rise until double in bulk (about 1 - 1.5 hours). Punch it down, and let it rise again (this time it will be less than 30 minutes). Prepare your loaf pans by thoroughly greasing them with shortening. Divide the dough into as many parts as you have pans to be filled 1/3 full, plus leave some dough, (size of an orange), for the ornamental decorations . To make ornaments, one of them being a cross, you roll out some dough into a rope like shape and form it into an ornamental cross, then place it in the center of the top of the bread. Now that your loaves are decorated, dip a pastry brush in whole milk, and gently brush the bread tops, and ornaments, to give them a nice golden crust color, once baked. For a darker shade of the crust, you may use a wash made out of one egg beaten with 2 Tbs. of water. Do not let the loaves rise longer than necessary, because the ornaments will lose their shape. Preheat the oven to 400 degrees F, and bake the bread for 10 minutes. Lower the temperature to 350 degrees, and bake for 30 minutes longer, or until done. Smaller loaves may be done a little sooner, so use your judgement. I place larger loves towards the back of the oven and smaller ones in the front part of the oven. To prevent the tops from over browning, you may loosely drape large pieces of aluminum foil over the bread, once the crust is golden. Remove the loaves from the oven and let cool in pans for 5 minutes. Then gently remove from pans onto a towel, or cooling rack, to cool completely. You may wrap cooled loaves with paper towels, then aluminum foil, then place them in plastic bags to store for few days in a cool place, or freeze them for later use. To thaw, keep covered loves in the refrigerator for at least a day, then unwrap and serve at room temperature. If you like raisins in your bread, you may add 1-2 cups of golden raisins to your dough before final mix. You also need to make sure to push them deeper into the dough before baking, or they will burn if sticking out of the bread. 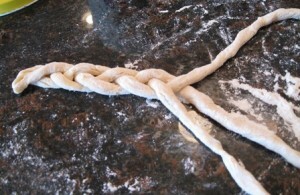 Here is a close up look of a technique for making a braid, and and a fancy cross, for the center of your Paska. You can also make other ornamental decorations for your Paska, such as a braids, rosettes, twisted swirls, cones, etc. With my Ukrainian mother-in-law ill and 6 hours away, I made paska for the first time today. (I’m “American”.) Thank you thank you thank you for your recipe and for the detailed description of what I could bake the paska in. They didn’t turn out as pretty as yours, but considering it was my first time baking bread, I’m happy they’re edible. Voistynu Voskres! I am so proud of you!! 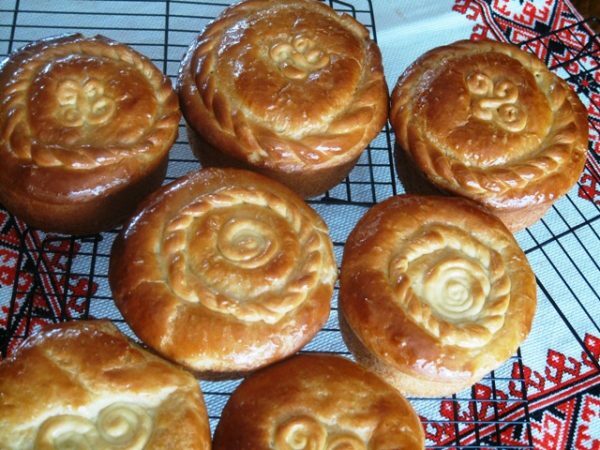 You are such a nice lady to bake paska for your family, to keep up with the Ukrainian tradition. You should also be very proud of yourself for taking up this time consuming task, but in the end it is so worth it. The whole house smells so sweet of the paska aroma, and everyone will love your paska, I am sure of that. We tried several different recipes, and my family loves this one the best. Happy Easter to your whole family. Hope your mother-in-law will feel better soon. She must be so proud of you as well. I have pans which are 8 x 3 aluminum. I have baked a paska using this one and it came out beautifully. No cracks or splits. My late aunt gave me a white enamel pan which is a bit bigger…that one split near the top. My recipe calls for 10 cups of flour. If I use three of the 8 x 3 do you think that would be enough for the the 8 x 3 pans? Your explanation is wonderful and the best I’ve seen. The total flour in my recipe is 10-11 cups (5 to start it and 5-6 to form the actual dough), so basically the same as yours. Since you fill the baking pans 1/3 full, you should have enough dough for your pans. 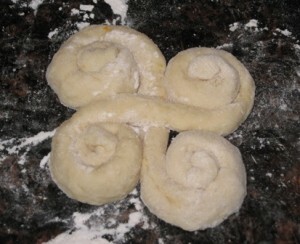 You can also divide your dough into 3 equal parts, this way all your paska’s will be the same size. Wish you success with your paska baking. I love the Ukrainian Easter traditions, with all the special foods and Paska, and Basket Blessing. I feel so lucky to be part of it all. Good luck with the baking. Is the lemon and orange flavoring noticeable in the Paska? And, is it always in Paska bread? I have found other recipes that do not call for either. I want Paska similar, but better of course, to the kind you get in a good bakery. The lemon flavoring is quite noticeable in the Paska, giving it a very fresh aroma. The orange is less noticeable, but maybe it’s aroma is lighter and the lemon overcomes it. They do make the Paska bread smell so delicious. This paska bread is light and airy, but not very sweet, which I like, since it goes so well with the ham and kobasa. To me, it is better tasting that Challa bread. I tried other paska recipes, and my family likes this one the most.I would love to hear your opinion regarding the taste and texture of these paska. Thank you so much for the quick response! I am going to make it for Easter. One more question…I may make one loaf with raisins. Should I add the raisins when I add the zest? I enjoy making bread…I find it to be a challenge. If you would like to try a fabulous white bread…go to All Recipes and search up the Amish White Bread recipe. It is absolutely delicious. Again thank you so much and I will post after the holiday! Have a wonderful holiday! I add the raisins once I add the remaining flour to the sponge, and get ready to knead the dough. Hello, I spent childhood Easters at my grandparents home in a wee village of Pennsylvania coal country. My grandmother made paska, hrudka, hrin and more. We prepared a basket filled with all the parts of our Easter dinner and took it to church to be blessed. After my grandmother passed away and families scattered, I determined to make paska myself. While I have made them for years now, I never seem to get them to taste like hers, although the smell of them baking sends me back in time! Hers always had a braid around the edge with a cross in the center and then in each quadrant, bent “nails” to represent the resurrection. I wanted to say how lovely your paskas are. We never had my grandmothers recipe and I never saw her make paska dough because we traveled from afar to arrive to visit, but your paska recipe looks quite close to what may have been hers. It is nearly identical to one I have from an old newspaper clipping in which a recipe from Savella Stechishin ” Traditional Ukrainian Cookery” was featured. The recipe however does not call for citrus, and it says one Tablespoon of salt, 1/3 cup sugar, and to add 9 to 10 cups flour to finalize the dough (I don’t think I have ever needed that much…) But sadly I am not a paska expert and I do not know if I’m doing it all right. Every year it is a different story it seems. Thank you for sharing your your knowledge about the paska. I am sorry this is so long! Khrystos voskres! Hey everyone! I tried to make some paska this year as I have moved far from home and can’t have my grandma’s for the holidays (also made some other yummy Ukrainian stuff). Overall I did pretty well, but my paska just isn’t coming out right! The flavor is good, but the bread itself is dense and a little too “wet” not dry and airy like nanny’s…..she doesn’t write any recipes down so I’ve been going online and trying to match it to what my mom says, but they aren’t sure why mine is so dense. Any ideas??? I assume you tried this recipe, hence the comment. I make my paska exactly as posted, and it comes out quite light and airy. You are not adding more flour than the recipe calls for, correct? You knead long enough until the dough separates easily from the sides of the pan and your hand, right? You do let it rise in pan all the way to the top, before putting it in the oven? You bake it long enough to be done (200 degrees F internal temp), and let it cool completely before cutting? If you follow all that then your paska should be light and airy. Also, you will get get better with time, so don’t give up yet. You have the taste perfected ,now you just need to concentrate on the technique. Thank you for your comments. Good luck with paska baking. My mother is now too old and frail to make the traditional paska so for the past three years I have taken over using her original recipe and other ones over time. I have found many recipes on the internet and yours is the next one to try as it sounds and looks wonderful. My problem is that every time I bake paska, every one of them split and crack. Doesn’t matter what recipe I use, I get same problem. It seems I have inherited my mother’s problem because her paskas used to do the same thing!! Any idea what causes the spitting and cracking? Also, if your paska did not rise enough (double in bulk) before baking, it will tend to crack easier, because the hot oven temp makes it rise so quickly. Sufficient kneading is also important to the way your paska will rise and its texture. Maybe you are overfilling your pans??? I fill about 1/3 of each baking container. If you follow my paska recipe and directions, your paska should come out as good, or better, than mine. Please keep us posted and share a picture. iv baked paskas since i was 18yrs old with my mom,reason for paskas cracking when baking is to much flour used and makes the dough dry, the dough should be more soft and u can add flour on the rolling board, to make dough soft and plyable to roll into a rope for the braids.also to get a nice color to the paska and for a nice airie look to it do not over bake. hope you have great results as i always do. Thank you for reading my post and for your informative comment. Your suggestion of too much flour, may be a valid one as well, but I also have been told by very well seasoned bread bakers that if the dough does not rise adequately before baking, it will crack. The intense oven heat will make it rise very rapidly, and make it puff out to one side and crack. This makes sense to me, so I believe that theory as well. Thanks for the recipe and detailed instructions and photos. Can you give me the weight of the yeast used? I’m not sure how much yeast is in one packet. And I buy yeast in 500g lots! I am not able to find fresh yeast in my location, so I use dry yeast for all my baking. Would a 9×2 pan be too large ? I am not sure if you are referring to a round or a rectangular pan. It will not be too large. Larger pans will produce lesser number of breads, but larger ones. You will need to watch the baking time, since it will take a little longer to bake a larger bread. Good Luck! I can’t wait try your recipe. Thank you for the detailed instructions. This my first attempt at bread making. I miss the Ukrainian Easter tradions that I remember from years ago. By chance do you have a pierogie recipe to share. I am so proud of you for trying to rekindle your memories of Ukrainian traditions, and especially the Easter traditions…as to me it is so special. 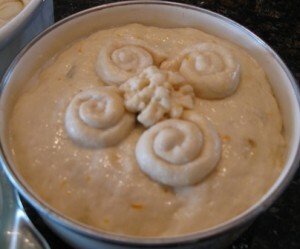 Thank you for visiting my blog and trying making Paska, Ukrainian Easter bread. If you check other categories I have my blog separated into, you will find many traditional recipes and many cultural posts. Our Baba passed away in 1999. Every year the rest of the family get together for one day. One year, we pooled all our family recipes into one book, and made about 17 copies of it. Its a Family Recipe Bible. And is used every day…Each recipe has a little story. And a name of the family member who contributed it. What a wonderful idea and such an invaluable family keepsake. Thank you for sharing. Could you please tell me what kind and size of pan you use for your paska. Also why does my bread always come out dense in texture. .. had a great taste but not light and airy. I have not tried your recipe but what I have tried is similar. First of all I like to applaud you for making your own Paska…it is a lot of work and time consuming, but so rewarding. There are as many Paska recipes out there as there are bakers…same could be said for any other traditional food item….varenyky…borscht…holubtsi…etc. My family loves this particular Paska recipe, that is why I make it…I have tried others as well. You are correct some Paskas are very light and airy, but others are a little denser. I think the ones which use a lot more eggs…or egg yolks are lighter…but that is my opinion only. Also, the longer time of mixing the dough and how well it rises also makes it lighter in texture. For the size and types of pans to use please visit my other post on that subject…..
Good day! I am somehow confused in how much flour you use in this recipe. I thought it was 5-6 cups of flour in total but in one of your previous answer you mention using a total of 10-11 cups of flour can you clarify for me . you say mix the dough of your first mix, is it in a y feeling the doughmixer and the second mixing by hand? My mother/in-law used to do everything by hand.i cannot dépend anymore on my mother-in-law as some of these recipes, she just made by feeling the dough: not good for me, not being ukrainian .can you help or am I confusing you? That is wonderful. I am very pleased to hear about your success. I normally make 2 – 7″, 2 – 6″ and 1 – 5″ Paskas from this recipe. These pans are about 2″ tall. I guess you must have used deeper pans. Happy Easter to you as well. Thank you for sharing your comment.